Other Products by Herbs Of Gold. Search other Reflux Indigestion products. 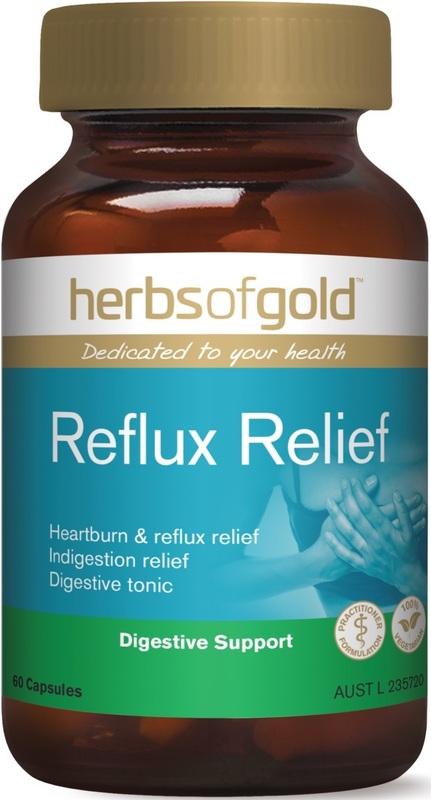 Herbs of Gold Reflux Relief is a blend of two herbal medicines, designed to target the relief of reflux, also known as Gastroesophageal Reflux Disease (GERD). This is where the contents of the stomach find their way back up into the oesophagus, sometimes even into the mouth. Apart from the fact that this is uncomfortable and can create social difficulties, stomach acid (hydrochloric acid) can have deleterious effects on dental enamal, and the lungs when the acidic vapour is inhaled through normal breathing. Herbs of Gold Reflux Relief is designed specifically—as the name suggests—to assist in the management of this condtion with the inclusion of the herbs licorice and amla. Amla, or Phyllanthus emblica L., was recently clinically trialled for GERD over a four-week period and was shown to reduce the incidence of heartburn and regurgitation, and also to reduce the severity when these did occur1. Amla is also known as Indian Gooseberry, or in sanskrit (if you speak it) Amalaki and has been used in Ayurvedic Medicine and Traditional Chinese Medicine for thousands of years. Well, modern science has to catch up at some point, right? And Herbs of Gold have done just that, providing you with a scientifically-validated, traditional-medicine-verified, concentrated Amla extract. Furthermore, Herbs of Gold Reflux Relief also contains Licorice, which is a source of a gelatinous polysaccharide called mucilage. This nutrient has the innate ability to reduce the interaction of acids and other harmful natural compounds with the mucosa, which is the lining of the intestines and stomach. This protects the mucosa and allows it time to regenerate. Furthermore, mucilage can soothe and heal the lining of the mucosa of the oesophgus, which is thin in comparison to the stomach, as it is not supposed to have to handle the harsh acids that the stomach has to manage. A clinical trial of licorice alone, indicated that it is helpful for the treatment of functional dyspepsia, which includes symptoms of bloating, epigastric pain, regurgitation, heartburn and loss of appetite2. Herbs of Gold Reflux Relief is a potent blend of two vaidated herbs, in convenient capsule form, designed to assist with the management of reflux. Does not contain added egg, milk, peanut, corn, soy, tree nut or animal products, yeast, gluten, lactose, artifical colourings, flavourings or preservatives.